For the heroine, pathologist Meg Daily, her part is fun to think about, again and again. Cate Blanchett would be sumptuous, as would Juliette Binoche. Then there’s Minnie Driver. Driver and Damon might recreate their relationship in Good Will Hunting. Could be a good thing, but not right for this story. I’d go with Laura Linney. I would love to see Telly Savalas portraying Lipsky, the gruff police detective. But Harvey Keitel could blow it away. Henry Branch, Eli’s brother, would be a complex role. Better ask Ed Harris for that one. For Fisher, the chairman of surgery, bring on Jon Voight. For Harvey Stone, powerful head of the biomedical device company, Donald Sutherland would rock. But, I love Bill Nighy in just about anything. And for Alex Zaboyan, Stone’s second in command, a skeptical Alan Rickman. For Tsarina, the temptress-turned-villain, a role-reversed Allison Janney would be sublime. And lastly, there’s Prine, a relatively minor character with major consequences for the ending. To be played by Scatman Crothers, from The Shining. I could “see” his face every time I wrote this character. Linda L. Richards' "Death Was the Other Woman"
Linda L. Richards is the editor and co-founder of January Magazine and a regular contributor to The Rap Sheet. Her latest books are the Kitty Pangborn novels, Death Was the Other Woman and Death Was in the Picture. That said, not long after Death Was the Other Woman was released in 2008, I was at a play that was produced and partly performed by my son Michael Karl Richards, who is a working actor based mostly in Vancouver. It was actually a series of plays known as The Good Doctor written originally by Anton Chekov and re-imagined for the stage by Paul Simon. So, obviously, my son was brilliant in several roles, but that’s not the point of this particular exercise. One of the plays was actually a monolog performed by a young actress I’d met before on several social occasions. I’d never seen her act before. And she knocked my socks off. And though she was playing a heartbroken Russian woman, almost from the first moment, she took my breath away. “Ohmigawd,” I whispered to my partner before very long. “She’s Kitty. I mean, she is Kitty.” It was like the character had gotten up and out of my book and strolled onto the stage. Adrianna Spence is an actor you probably have not heard of, but she’s immensely talented and, to my mind, she could handle all aspects of the Kitty character, including the physical. Spence is young, lovely in an incredibly cute way, her coloring is just what I had in mind when I wrote Kitty: the sort of pert redhead who entrances men with a proclivity for that particular combination. I think many, many actors – men of a certain age – could do a fantastic job with Dex, the damaged World War I veteran who is Kitty’s shamus boss. It actually would be the kind of role a lot of people would enjoy playing, I think. Dex is critically damaged; fatally flawed. Actors like dealing with the sort of challenge and nuance that sort of role brings. So I’ll give you two names. Either would do wonderfully as Dex. Russell Crowe seems to inhabit and embody the necessary damage and danger Dex brings. I think also Robert Downey Jr. would do a great job. He’s a wonderful actor and he really walks that walk. And both of them would look killer in a high-crowned fedora. But again, I have a great deal of respect for the acting profession and understand that a dozen competent people would bring a score of different things to those roles. I’d love to see any of them have a run at it. What fun to see your waking dreams brought to life. Gabriel Cohen is the author of Red Hook, The Graving Dock, and Neptune Avenue (coming April 27, 2009, from St. Martin’s Minotaur), three crime novels featuring Brooklyn South Homicide detective Jack Leightner. He is also the author of the novel Boombox and of Storms Can’t Hurt the Sky, a nonfiction book about how to recover from divorce. He has written for the New York Times, Poets & Writers, the New York Post magazine, Crimespree, and other publications, and will be the guest lecturer aboard the Queen Mary 2 ocean liner in May, 2009. He lives in Brooklyn, New York. It’s funny—not ha-ha funny, but I just fell down a flight of stairs and got severely banged up but I’m still alive funny—but this was almost not a theoretical question for me. 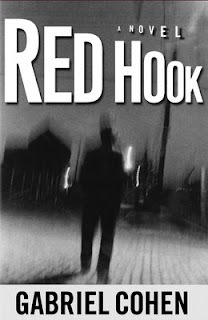 My first novel Red Hook came out in 2001. After it got nominated for the Edgar award the next year, I got a hotshot Hollywood agent. In very short order, she found an interested production company (Denis Leary’s) and an interested screenwriter (Will Rokos, who was very hot that year as he had just co-written Monster’s Ball). There was just one inconvenience: they needed some serious studio money to make the film happen. I didn’t let that little detail faze me. I was too busy dreaming about the single phone call, the tap from a studio head’s magic wand, that would instantly transform my life for the better. No more struggling to pay the rent. No more part-time gigs doing work I had zero interest in. No more plugging away in total obscurity. My agent asked me to come up with a list of possible actors for the lead role. I figured, hey, why not start at the top? I still have the list on my computer: Robert De Niro. Nick Nolte. Ed Harris. David Strathairn. Etc. My books are as much about the mysteries of human character as the simple question of whoddunit, and I had gone to great pains to give Jack Leightner, my protagonist, a complex, well-rounded life. Aside from the big case he was working on, the divorced cop was struggling to deal with a difficult son, an uncertain new romance, and a painful secret from his childhood. It seemed (and still seems) like a dynamite role for a middle-aged actor looking for a meaty challenge: a flawed but deeply sympathetic human being, a homicide detective confronting his own mortality and personal life. To make a short story even shorter, my little bubble managed to stay afloat for just a week. Our attached screenwriter made the rounds of the big Hollywood studios to pitch the tale. Nobody bit. Maybe there weren’t enough car crashes or explosions in the plot. And that was that. The End. A little window of magical opportunity opened for a second, and then slammed shut. Back to the daily work. Which is okay with me, mostly, because I love the writing. My third Jack Leightner book, titled Neptune Avenue, will be released soon by St. Martin’s Press and I’m hard at work on a fourth installment in the series. I’m just as excited about deepening my protagonist’s character as ever. I don’t dream about Hollywood very much anymore, though I would love for some serious, thoughtful star, writer, or director to get interested again. Barring that, I’d even settle for a hack job. Why? Because the money would enable me to focus even more intensely on my writing. But what about quality, you ask? What about ensuring that the movie lives up to the promise of the book? David Blixt's "The Master of Verona"
In David Blixt's The Master of Verona, Shakespeare's Italian characters meet the historical figures of Dante's Inferno, setting the stage for the famous Capulet-Montague feud from Romeo & Juliet. Weir - did you see Master and Commander? Jackman - because he, like Cangrande, is everything a man should be. Hathaway - beautiful, but empty. Brooks - he, too, is everything a man should be. Keach - because he'd eat this role alive. O'Toole - he's too old, but he would still be genius. Read an excerpt from The Master of Verona and learn more about the book at the official website. The Page 69 Test: The Master of Verona. Zachary Lazar's first novel is Aaron, Approximately. He graduated from Brown University, has been a Fellow at the Provincetown Fine Arts Works Center, and received the Iowa Writers Workshops James Michener/Copernicus Society Prize. DeLuca: Do you know about Sway, Zachary Lazar's novel about the Stones in the '60s? Scorsese: I have a copy of it. I haven't read it yet. I have stacks of books which I intend to read while shooting, which is impossible. [Laughs]. I could do without the [Laughs] part, which seems to underscore the “I haven’t read it yet” part. Still, while this internet chat may be as close as I ever get to seeing my novel turned into a movie, the mere idea of the book being in Scorsese’s possession (even if it remains unread) is exciting. But I wonder who could play any of my novel’s characters in any case? The recent Brian Jones biopic “Stoned,” which covers some of the same ground as Sway, shows how difficult it is for an actor to play a rock star without becoming a cartoon in the process. Another of Sway’s strands—the story of the Manson Family—poses the same kind of challenge, which was demonstrated in Jeremy Davies’s recent portrayal of Charles Manson in the remake of “Helter Skelter.” Perhaps the story is best left as a book (though I’d probably not complain if anyone wanted to make a movie out of it). It is a movie that forms Sway’s connecting thread, Kenneth Anger’s 1969 short film “Invocation of My Demon Brother.” I once saw that film with Anger standing right behind me in the darkened theater, and it felt as if he was peering right through my skull into my mind. In a sense, this is the reverse of what many viewers of “Invocation” feel: as though they are peering directly into Anger’s mind. It is a quick, dark, powerful film—in its abstract way, it sums up everything corrosive and fatal about the counterculture of the 1960s. Anger’s reputation as hostile, even towards those who admire him, is legendary, and as I said, I felt in that theater as if he was peering into my mind. If he was, then he would have known that even then I was in the process of making a book out of his movie. Read an excerpt and learn more about Sway at the publisher's website. Check out Lazar's playlist matching songs to the chapters in Sway. The Page 69 Test: Sway. Chris Marie Green writes the Vampire Babylon series. Night Rising, Book One, was reissued in mass market format on January 27, 2009, and Midnight Reign and Break of Dawn are already available in trade editions. A Drop of Red, Book Four, will be released in trade on March 3, 2009. Welcome to Hollywood after dark, where the stars shine brightly, the famous fall from their sparkling heavens, and the vampires lurk just under the ground, waiting for their own chance to “make it” in the biz. So how does a writer go about populating an urban fantasy such as this? I would start with the hunters. The main heroine, Dawn Madison, is a lean, mean ex-stunt woman who’s returned to town to discover the whereabouts of her missing father. She’s got a lot of attitude that covers a few soft spots that she’d rather keep buried, as well as a real complex about her mother, a beautiful superstar whose unsolved murder made her a silver-screen legend. Even though Summer Glau has cornered the market on vulnerable scowls in action franchises, I’d love to see her wielding a machete at some vamps in the wilds of L.A.
Dawn’s co-worker at the paranormally inclined “firm” that employed her missing father is a far harder part to cast. Kiko Daniels is a twenty-something “little person” actor whose career is on the skids. But his psychic powers and hunting skills keep him cocky and confident, even when his agent can’t get him much work during the day. I’m not sure who’d play this role—someone unknown? A blond-haired, boyish guy who wears a soul patch with panache? The third team member, Breisi Montoya, is a former Mexican soap opera actress, around thirty years old and seemingly too long in the tooth for the ingénue parts that used to give her a paycheck. But she’s hell in the lab, where she creates the team’s weapons, and she can handle a mean saw-bow outside of headquarters, too. I don’t know how tall Bianca Marroquin is, but this woman would carry petite Breisi’s trademark Louise Brooks hairstyle pretty well. Dawn’s missing father, Frank Madison, is a former bar bouncer. He was everyone’s best buddy at tequila hour and, as far as his daughter knew, lived a wastrel’s life. But that was before she found out that he was a vamp hunter. Tough yet world-weary and remorseful, Frank is Bruce Willis. He was really the only character model I had while writing these books. And then there’s Jacqueline Ashley, a rising starlet who befriends Dawn whether Dawn likes it or not. She’s plucky and naïve, sweet and wholesome. She’s also been targeted by studio suits to become the “next big thing,” seeing as she has a certain je ne sais quoi that defines a true star. I can see Jac as a twenty-three-year-old Charlize Theron, but with long strawberry blond hair. Last, but not least, we’ve got “The Voice,” who communicates to his vamp hunting team only through speakers. It sounds as if his tone has been dragged through centuries of fights, and there’s a hint of “the old country” in every carefully chosen word. Michael Wincott’s tortured voice would be just the thing for this mysterious guy. For more about Vampire Babylon, including book videos and excerpts, stop by www.vampirebabylon.com.